Alagna fans will hardly need the stimulus of a review to rush out and buy the tenor's first foray into the Christmas music market. And their instincts will be spot on, for this is a highly entertaining and often moving addition to his discography. In joining such a tradition, Alagna may be perceived by some to be taking something of a risk, but as an annual outing (it is Christmas after all!) it's a fine idea which other tenors such as Domingo and Mario Lanza (who Domingo and Alagna both greatly admire) have also espoused and given enormous festive pleasure. This CD will doubtless find its way into many stockings and will be played to entire families, many of whom will have had no previous interest in the classically trained tenor voice. So Alagna and the EMI team have been particularly wise to commission brand new arrangements replacing those many tired old warhorses which certainly wouldn't appeal to younger non-classical listeners. New songs, including one by Alagna himself (a fine melody for Gentil Père Noël), also give the album a strongly contemporary feel. 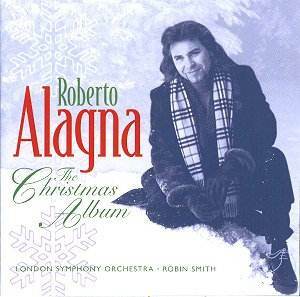 Old Christmas carol favourites, of course, abound and the new arrangements of Adeste fideles, Silent Night!, Away in a manger, and Deck the hall work particularly well, with Alagna choosing a style of singing appropriate to the mood. Only The First Nowell really misfires where Alagna sings fortissimo throughout and accusations of can-belto could be justifiably made against him. God Rest You Merry Gentlemen, however, is extraordinary with an opening orchestral salvo that not only could come out of a Hollywood movie, but a major science-fiction blockbuster to boot. But it works! The new pop song for Christmas The Love of a Child by Russ Ballard and Chris Winter is truly beautiful and sincere. In a different context it could be a chart hit. But the most interesting of the 18 tracks has to be Guardian Angels a relatively unknown Christmas song by Harpo Marx (no less) and Gerd Beilenson. Sounding all the world like a traditional, high quality Neapolitan Song, this is a real discovery made all the more moving by the inclusion of a verse from eight year old Connie Greaves. Downsides? Well the fact that the orchestra was recorded at one time in one location, the choirs likewise in two locations and Alagna, presumably all alone, at yet another studio does threaten the integrity of the performances occasionally. Once or twice one has the feeling that Alagna is not quite sure when to start singing at the beginning of the songs, and in order to achieve a semblance of unity there is rather too much artificial digital ambience used by the engineers to hide the seams. There are no words of the songs printed in the booklet - surely a chance to sing-along would have been a boon under the circumstances - and it would have been nice to know exactly what Alagna was so passionately trying to convey. But, ultimately this is a fine CD from the great 'mixed-medium' album tradition and I can see it going down very well indeed, along with the mince pies and the port. Alagna will doubtless create many new, albeit unsuspecting, fans with his Christmas Album and one only hopes they go on to explore a little of his Gounod, Massenet, Puccini or Verdi rather than choose to wait for yet another popular excursion.